If, as Orwell wrote in Politics and the English Language, obfuscatory language is designed “to make lies sound truthful and murder respectable,” the euphemisms used by the liturgical reformers to kill the Mass of the Pre-Sanctified reveal their unethical methods. Pius XII’s Liturgy Commission turned out to be a particularly fertile ground for euphemisms, in other words, verbal sleights-of-hand to cloak the reforms in opaque language so as to make the consequences sound less devastating. Where the progressivist reformers wanted to divest the Church of an ancient and venerable rite, they talked about “simplification” of the liturgy, cutting away “unnecessary duplications” and “medieval accretions,” as a “restoration” to original and purer meanings. This coded language created a sense of complicity among the members of the Commission and their collaborators, but it caused perplexity and alarm among the non-initiated. When Msgr. Léon Gromier, an eminent authority on the Ceremonial of Bishops and a Consultor to the Congregation of Rites, stated that the Mass of the Pre-Sanctified became a “victim of a cabal,” he was immediately laughed to scorn, his criticism dismissed as unworthy of serious consideration. (2) He was publicly derided and his reputation ruined, but he was later proven to be correct. 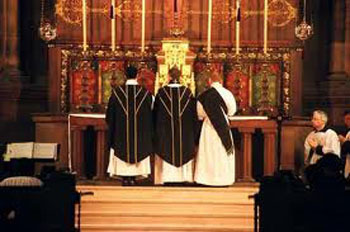 The Liturgical Commission established by Pius XII in 1948 was staffed by only half a dozen hand-picked reformers headed by Fr. Annibale Bugnini. They worked in the strictest secrecy with a mandate to establish the groundwork for a reform of the Church’s entire liturgy. Their deliberations were printed privately in 1949 by the Congregation of Rites as an internal “Memo” and circulated among a select few collaborators of Bugnini’s choosing, thus concealing their plans from the rest of the Church. It is noteworthy that Fr. 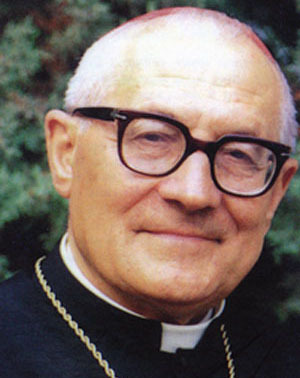 Antonelli, who would sign the decree introducing the Novus Ordo in 1969, also signed the “Memo,” but acknowledged that it was mainly the work of his colleague in the Congregation of Rites, Fr. Joseph Löwe. And it is from this “Memo” – published for general consumption only in 2003 – that we see the Mass of the Pre-Sanctified high on their agenda, waiting, as it were, on death row for its impending execution. An examination of the role that the “Memo” played in the Good Friday reform shows that the Mass of the Pre-Sanctified was given the equivalent of a show trial, condemned and promptly purged from the Church’s liturgy. Let us read that again to savor its full implications. 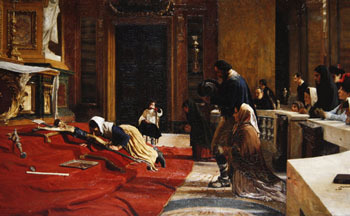 What he was effectively saying was that one of the oldest rites of the Catholic Church – one, to boot, that was canonized by Pope Pius V – was not worthy of respect and preservation because it was tainted with heresy and superstition. That is surely chutzpah on a grand scale: It was an indictment of the principle lex orandi lex credendi on which the Church’s entire liturgy relies. It is not even an intellectually respectable argument, as it is also contrary to common sense, logic and a Catholic sensus fidei. The controversy blew itself out so many centuries ago that the information provided by Antonelli is no longer germane to the topic of Good Friday. So, why raise the issue in 1948? All of these points show that Antonelli was merely using the power of suggestion to compensate for his lack of solid evidence. We can conclude that his remarks were based on innuendo to cast aspersions, doubt and misgivings about the authenticity of the pre-sanctified rite and lead readers to the conclusion that it was superstitious. This was done by a skilful choice of words that implicitly suggest but do not assert that conclusion. Nevertheless, a statement does not need to make a direct attack in order to smear a reputation – a defamatory implication or innuendo can be even more dangerous because the underlying message slips disarmingly into the subconscious mind. The important issue is the impression that the statement is likely to make on those reading it. As a copy of the “Memo” was presented to Pius XII in 1949, (5) one wonders if he, too, as well as the talking heads of the Liturgical Movement, was swayed by its propaganda which was made to sound credible by specious reasoning. Tragically for the Church, it was this false and malicious innuendo instigated by Antonelli that entered the liturgical reform movement and led to the demise of the Mass of the Pre-Sanctified. 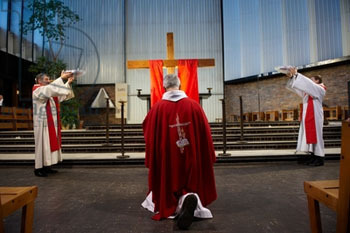 ‘A cinquant’anni dalla riforma liturgica della Settimana Santa’ (Fifty years after the Liturgical Reform of Holy Week), in Ephemerides liturgicae, CXX, 2006, n. 3, July-September, p. 315. Msgr. Gromier delivered his criticism of the reform in a 1960 lecture in Paris, after which he was mercilessly mocked and vilified. He was subjected to a blistering attack full of personal abuse by Fr. Louis Bouyer who portrayed him, among other things, as a “drooling” and “doddery old Canon” obsessed with ancient rubrics. See La Maison-Dieu, n. 62, 1960, p. 152. Gromier lived the rest of his life under a cloud of ostracism by the Vatican. Ferdinando Antonelli in Carlo Braga, ed., La Riforma Liturgica di Pio XII: Documenti, vol. I - La Memoria sulla Riforma Liturgica, 1948, Rome: Edizioni Liturgiche, 2003, p. 65. Michel Andrieu wrote a series of articles called ‘Immixtio et consecratio’ which were published in the Revue des Sciences Religieuses between 1922 and 1924. They were based on the most thorough and meticulous historical research from primary sources. Fr. Antonelli wrote a note in his diary, dated July 22, 1949, to say that the "Memo" was presented to Pius XII by Card. Micara and that he (Antonelli) was present on that occasion. Apud Nicola Giampietro, El Cardinal Ferdinando Antonelli y la Reforma Liturgica, Ediciones Cristiandad, 2005, p. 42, note 30. .